I don’t think I’ve heard that expression before I moved to the U.S., but once I did (moved and heard) it felt intuitively understandable and logical. I knew that it wasn’t a rule actually imposed or followed anymore, but it came naturally for me since I didn’t wear white clothes either before, or after that arbitrary check mark in the calendar. I don’t have anything against the color white per se (unless we’re talking about cars: for whatever reason it’s my least favorite color for a car exterior), but I grew up thinking of white clothes and shoes (especially shoes!) as of completely impractical and wasteful. Where I lived, people weren’t really poor but everything was a little scarce: nice(r) things were hard to get, so everybody used what they managed to buy for a long time. Many people did not have washing machines and there were no dryers – so there was a tendency to wear clothes longer between washes than we normally do nowadays. Most people used only public transportation, which was in a much worse state of cleanliness than those that I do not consider clean enough today. Somehow streets even in big cities were much dustier in dry seasons and muddier in wet ones than even in suburbia where I live now. And on top of that we didn’t have that many hot weather days compared to cold or at least cool months. So with all that in mind, it’s not surprising that many of us favored “not easily soiled” clothes. Long after I moved to the U.S., started buying as much clothes as I wanted and even got my own washing and drying machines, I still steered clear of white in my wardrobe – just out of habit. Until several years ago, while on a vacation, I realized that I kept admiring white dresses, pants and tops that one of my friends was wearing. After some internal negotiations, I agreed (with myself) that I didn’t have to be practical any longer. I could afford (in all meanings) to start wearing impractical* white things from time to time. WHITE by Puredistance was a strong “like” for me from the first spray: it was so bright, happy and sunny. And immediately in my head it became a summer time perfume – not as something I would wear in a heat wave’s afternoon but perfect for a warm summer night out. I tested WHITE, liked it, and told myself that I’d buy a bottle once my samples were gone. But then the fall came, I moved to wearing my colder season favorites, while waiting for the next WHITE-appropriate season. I do not know what makes WHITE a summer perfume. When I’m thinking about it, I can’t say that WHITE is lighter or less opulent than, for example, Amouage Dia or Frederic Malle Iris Poudre, both of which I associate with autumn (or even with our NorCal winter). And still WHITE feels right for the white clothes season. Have you seen already Puredistance’s new website? It’s white! 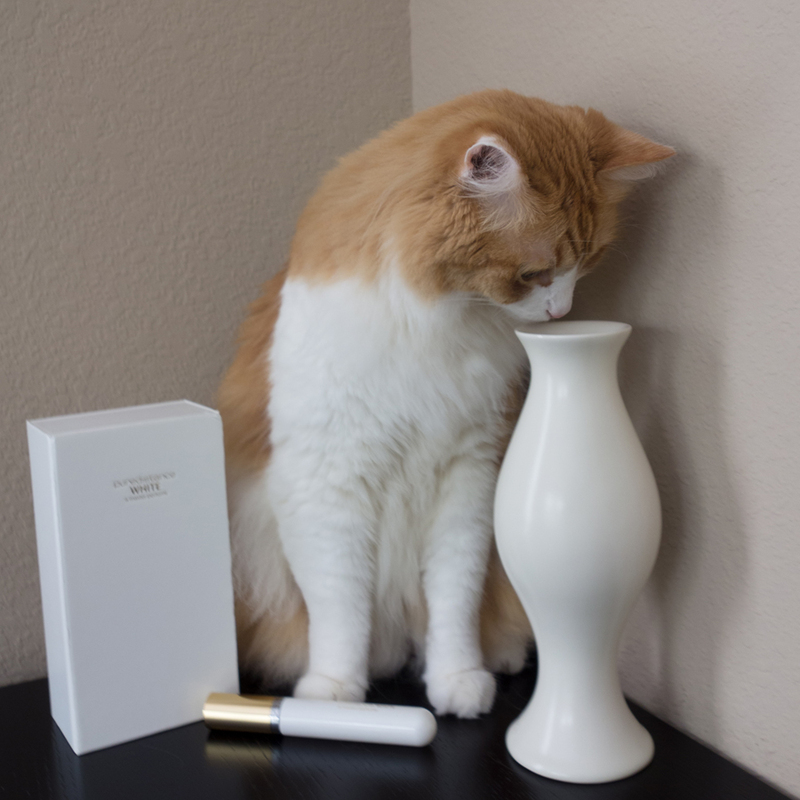 This entry was posted in "Four legs good", Favorite Perfumes, Not a Review and tagged Puredistance, Puredistance White. Bookmark the permalink. I was wondering about this American thing no white after Labour day. I mean, why? If it’s still hot, white is a good choice to wear. September in CRoatia tends to be still rather warm (we’re up to 30 degrees Celsius most of the days) so I’m still enjoying some of my white summer clothes. It’s a long way to next year’s white. Oh, is there a beginning date when you’re allowed to start wearing white? P.S. Of all the Puredistance perfumes, White is the one I really didn’t like. I couldn’t resist responding since I know Undina is still sleeping (or she better be as we have a 3 hour time difference and I know she doesn’t work the night shift). July 4th is the “official’ start of wearing white. As to how non-sensical the rule is, consider this – Why do New Yorkers wear blackk all the time? Because there is nothing darker than black! I was sleeping – so thank you :), but I’m afraid you are misleading Ines: from everything I read, it’s Memorial Day, not the Independence one, that is the “official” start of the summer. You’re right! I should have been asleep when I wrote that! Dearest Undina, you got me into White with sharing your precious sample with me! I have to admit that it was not love at first sniff but after trying it again and smelling it on Asali (whom I met in Copenhagen last year), I decided that I must have it, at least in the travel size…so I bought it when I got home. I wore it to work one day and 2 of my co-workers kept coming over to smell me and wanted to know what it was, etc. I don’t think they ever bought because of sticker shock. P.S. I have not been to the website lately. I just looked and OMG, I never realized the Antonia travel spray is in that GORGEOUS green! I will get White soon. Unfortunately, I missed their summer promotion, so now I’ll be waiting for the next one. I keep getting drawn to the website to see that gorgeous green atomizer. See what you did??? 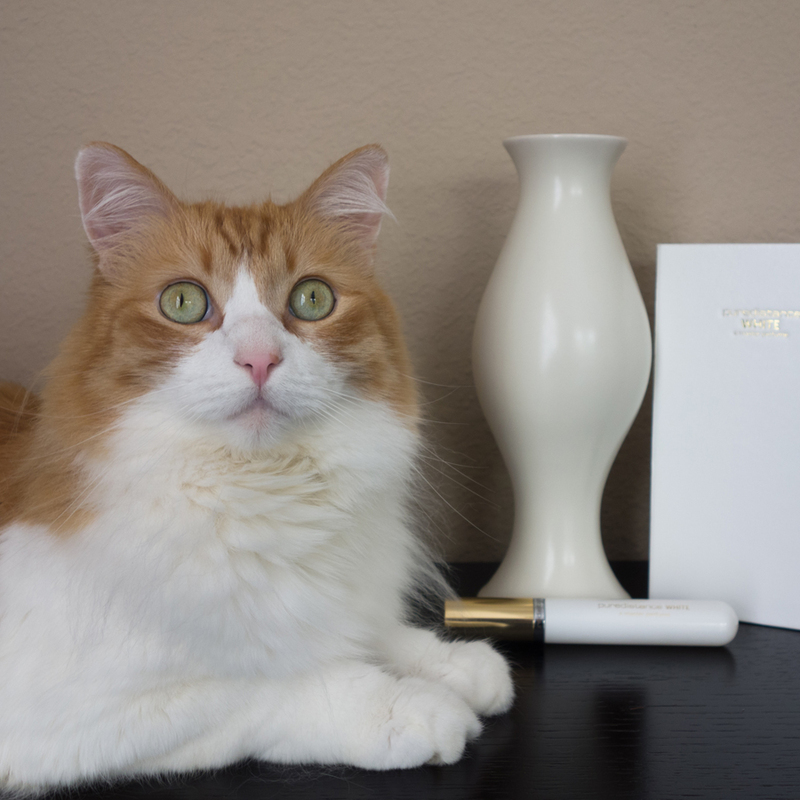 And gorgeous Rusty is encouraging you to buy White already :-). You can probably wtrite to Mary and ask for the same deal. I have found Puredistance to produce perfumes with the best quality and it also has client service to match! As someone who has just spent two days bleaching a brand new white light pull cord that the electrician managed to get grubby down the last foot of its length, I can attest to the impracticality of the colour white in many other contexts, though I still like it! Not men in white shoes, mind you, on or off the golf course – I draw the line at that. The expression that inspired your post reminds me of my mother’s saying; ‘Ne’er cast a clout till May be out’, a propos of summery clothes generally. I also associate PD WHITE with summer, though I agree there is no logic to that based on how it smells. Must be the subliminal suggestion of all that white packaging. Love the shots of Rusty, by the way. He has got his own whites Daz clean! LOL at Daz clean. For non-British readers this was a washing detergent heavily advertised on telly in the 1980s. I don’t think it’s the packaging: Antonia has a very similar white box but for me it’s a spring perfume. But maybe it’s the name (“what’s in a name?”, eh? ;) ). I enjoyed your memories of why you didn’t wear white. I remember as a little girl my Mom making a big production of putting our “Sunday” dresses, some of which were white, in those plastic storage hangers everyone used back then. Even though hot weather continued for another month in Texas, we would switch to “autumn” clothes. I love the photo of Rusty channeling “white”. I haven’t tried this one yet but have never heard of anyone not liking it so I need to seek it out. I wish we had those covered storage hangers back then: it would have made our lives and clothes-preservation efforts so much easier! I think all Puredistance perfumes are worth trying: you won’t love all of them, but, most likely, there will be at least one or two that you will. My favorite subject Puredidstance White…my favorite perfume! As for white clothes, if you’re a bit chunkified like myself, white clothes make you look even more so. So while being impractical, it’s also a fashion no for me! Yay Rusty! Rusty looks good “in white” though. It’s curious, these rules we make… Sometimes they make sense. Like your gravitation to other fragrances in cooler months. Although I do love an off-white in winter months. Is there an off-white perfume? Wonder what THAT would smell like. Also another memory. For about 5 years I participated in an annual Winter Solstice show. A mad extravaganza with giant puppets and countless wild children. It was an abstract and raucous affair with a different story each season. But every year the entire cast dressed in white to celebrate the coming of the new year and sun. White from the resale store, shabby and madcap. The theaters were dirty and we’d all be filthy by the end of the run. But under the lights, it looked fresh and new. Off-white perfume… It’s an interesting question. I think it should have iris in it. But nothing comes to mind beyond that. Thank you for sharing your memories: I love those small glimpses into others’ lives. White aprons on special days – what an idea! Makes me smile to think of it. The only white in my wardrobe are underwear. Total mess maker here. I think grey marle is the closest I get. How freaking cute is Rusty, please give him a treat from me. Rusty got 2 treats in your name :) To tell you the truth, I still can’t understand how he manages to keep his fur that white! Undina, learning about how wearing white was not practical in the country you grew up in was quite interesting and makes perfect sense. I’m glad to hear that you now feel uninhibited in that regard though, as I agree with you: white sun dresses, especially, are so pretty, and I also think that white can carry through into winter in surprising ways (white jeans paired with a black turtleneck or a sleek black sweater can look elegant in fall or winter … sort of has an unexpected chic factor going for it). And as for Puredistance White, I’m in agreement with you there, too. I purchased a bottle after testing it last year. Puredistance white wasn’t really a winner for me, mostly because in that genre there are others at more reasonable prices. I know exactly how you feel about White: on more than one occasion I had exactly same thoughts. Almost any perfume that $3/ml and up should be a strong “like” (and preferably “love”) – or it seems unreasonably expensive.